The world-famous Laura B makes the early-morning trip to Monhegan every day during the summer season, and delivers all the freight to the island year ’round. She has both indoor and outdoor seating. She is also available for private charters and for hauling freight to any of the islands. 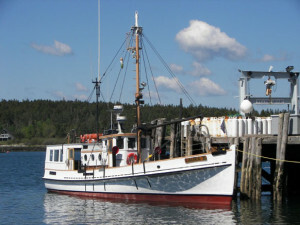 Built in 1943, the 65-foot Laura B is rigged as a heavy-duty work boat. Originally designated a U.S. Army T-57, she spent World War II in the Pacific, where she served as a patrol boat and carried troops and supplies. She came under fire during those days, and carried two 50-caliber machine guns on deck. This rugged vessel was brought to Maine in 1946, and spent the next few years transporting lobsters from Vinalhaven to Boston and New York City. 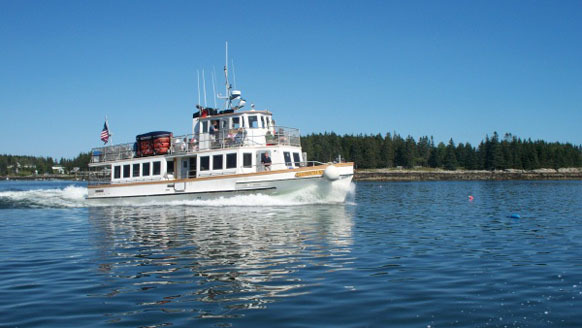 For the past half century, the beloved Laura B has been ferrying passengers, freight, and mail between Port Clyde and Monhegan Island. A prominent marine surveyor has described her as the best-maintained wooden vessel on the Eastern Seaboard. Like the Laura B, the Elizabeth Ann carries passengers and mail to Monhegan year ’round. Launched in 1995, this comfortable and stable passenger vessel was built according to the latest advances in marine architecture and engineering. Sixty-five feet long, she offers seating in the heated glassed-in cabin, on the covered stern, and up on the sightseeing deck. She has two bathrooms.